기사 요약: 황교안 전 국무총리가 15일 오전 서울 여의도 국회에서 공식적으로 자유한국당 입당식을 갖고 입당 기자회견에서 현 정부를 비판했다. Former Prime Minister Hwang Kyo-ahn on Tuesday joined the main opposition Liberty Korea Party, distancing himself from irregularities under ousted former President Park Geun-hye and emphasizing “unity” as a key value, amid political parties’ criticism of his party membership. Hwang’s return to politics has ramped up competition at the conservative party’s national convention next month, with the real possibility he may run for the party’s leadership and in the 2022 presidential race. 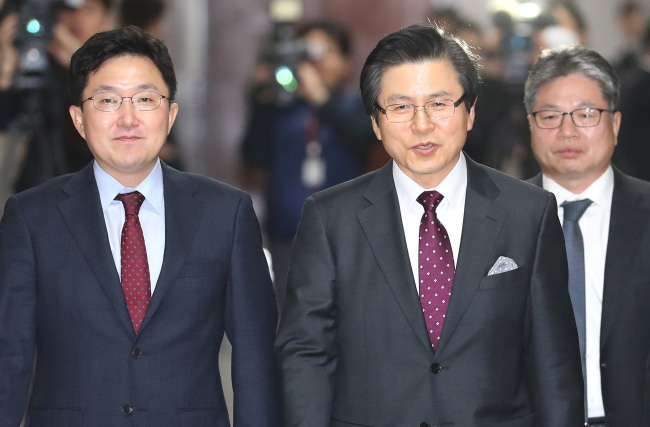 Referring to Hwang’s membership as “the beginning of season two of Park Geun-hye,” the ruling party and minor opposition parties criticized Hwang for returning to politics despite his role in the Park administration. “The government is obsessing over the past. We need to create a better country with the spirit of unity. ... I have decided to join the party to practice proper politics free from factions,” Hwang said during a press conference at the National Assembly. Hwang briefly apologized for the fiasco under the Park administration, under which he had served in key posts, but he distanced himself from irregularities that took place. “I cannot agree to all government employees (that had worked under Park) being labeled in relation to the deep-rooted corrupt practices,” he added. 기사 요약: 택시 업계의 극심한 반발에 부딪혀 난항을 겪어온 카카오의 승차 공유 서비스 ‘카카오 카풀’ 시범 서비스가 잠정 중단됐다. South Korean tech giant Kakao said Tuesday it will suspend the test run of its carpooling service, following a monthslong standoff with taxi drivers who claim the business will threaten their operations. In a statement, Kakao said the company will no longer provide the trial carpooling service to users until it reaches a consensus with the taxi industry. The company said it would even consider scrapping the carpooling service altogether. “There are no conditions attached to the dialogue. … We are committed to engaging in talks with an open attitude that service launch could be canceled,” said Kakao Mobility, which operates the Kakao Taxi service within the Kakao T mobile app.